When you're 5 it's all about rainbows. I love it. 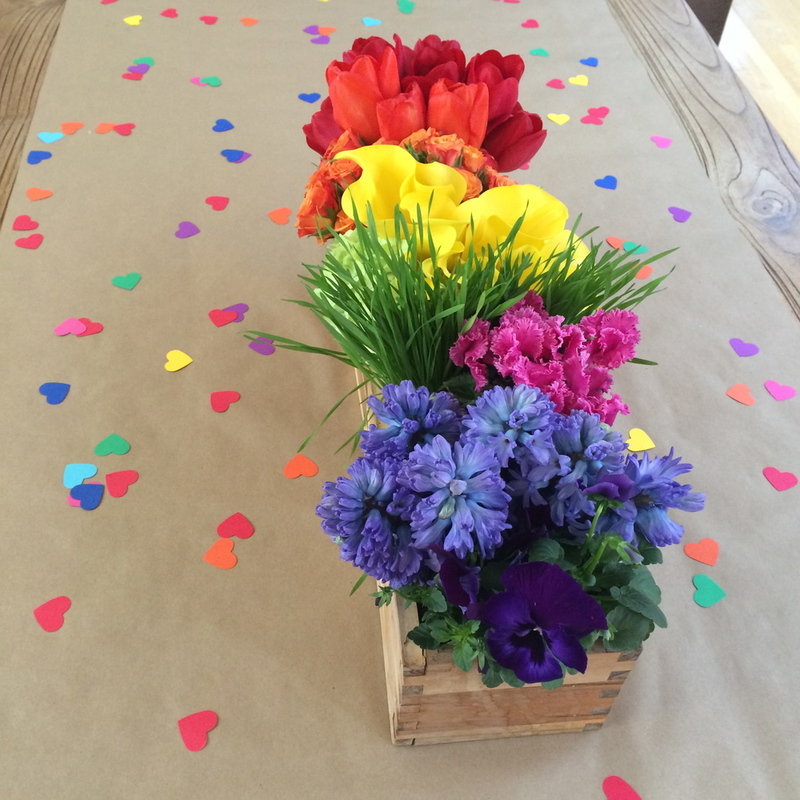 This year we cut out hearts in shades of the rainbow and I sewed them together. We hung them in windows or from the ceiling and smiled as they gently spun throughout the day. It seemed only appropriate to make a rainbow from flowers and plants to match. A simple little succulent in a glass votive. First put some small rocks on the bottom and then cover the roots and dirt with some moss. For some festive flair use fine glitter on wooden skewers and make tiny pennants from paper. A sweet gesture for a birthday or whatever occasion needs a little H A P P Y.
Clementine's school has a big Winter Faire every December. This year's theme was woodland; one of my favorites! 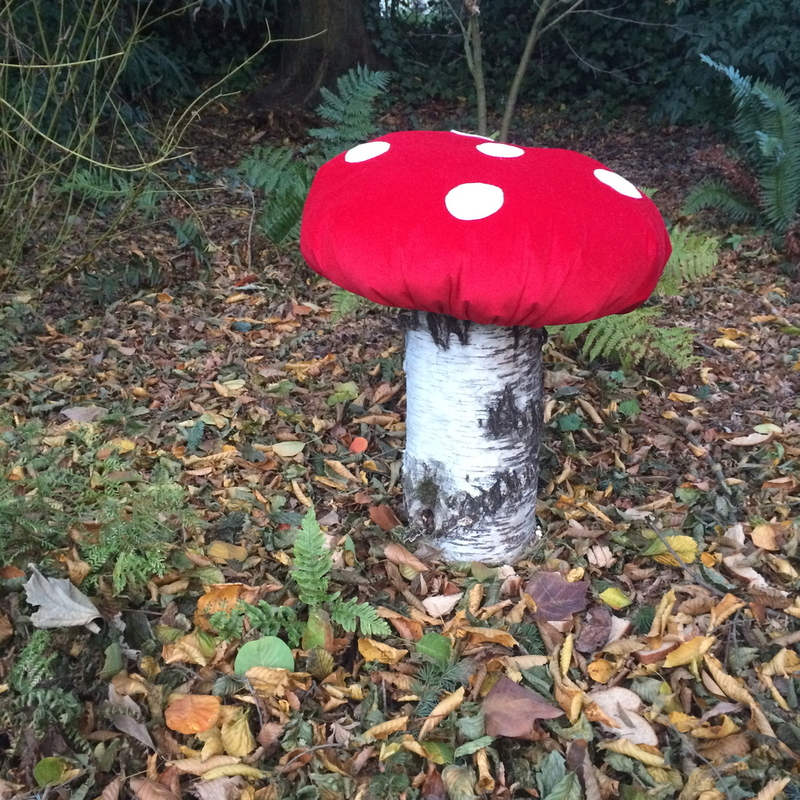 I made all different sized mushrooms out of red velvet, burlap, stuffing, and logs. It was a super fun project. 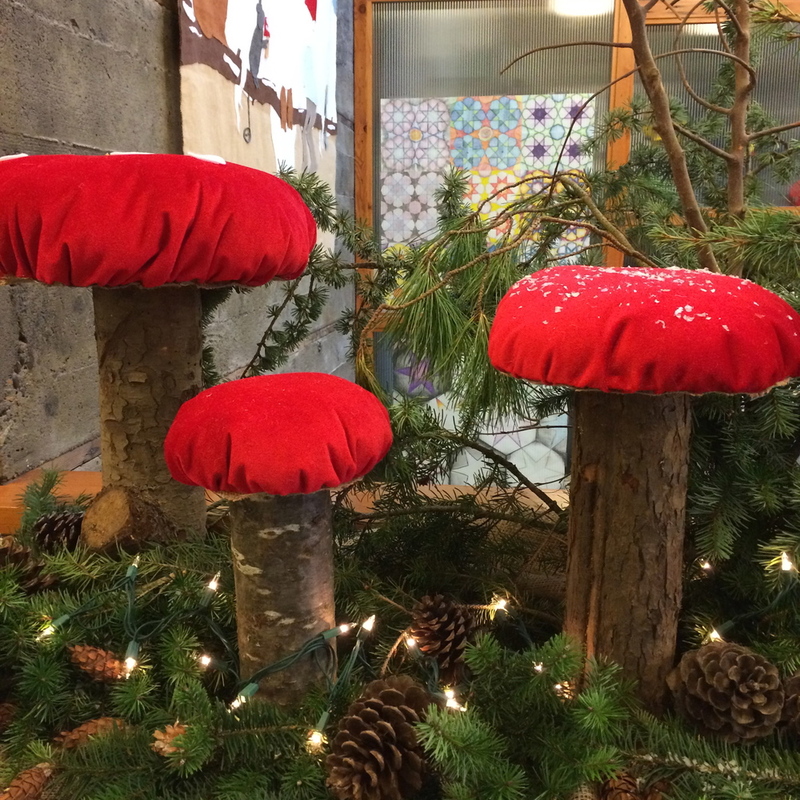 I arranged the mushrooms with fresh evergreens, lights, and pinecones. Magical! Happy Holidays from our gnome to yours! 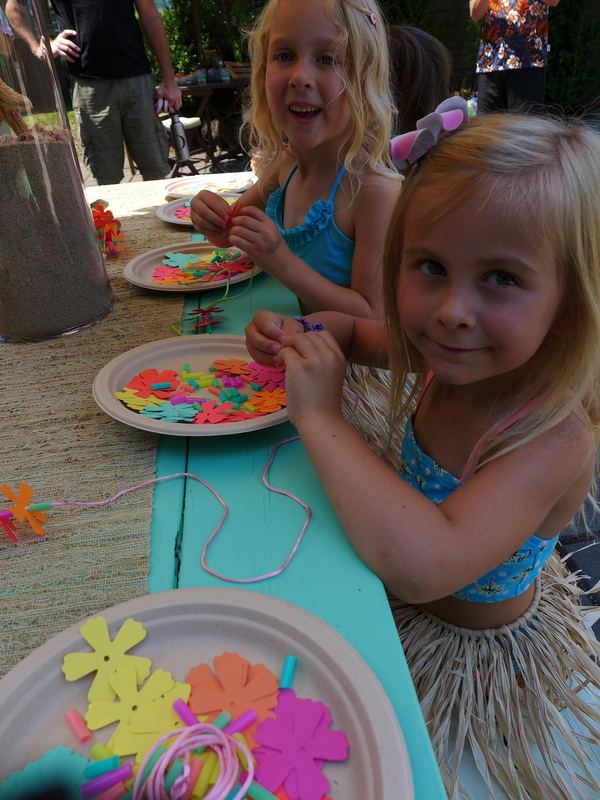 What better game for a hula party than hula girl ring toss? Call those rings hula hoops and you have twice the amount of hula fun! I used green tape to make a "bikini bottom" on each doll. Next, I hot glued the sequins ribbon to make a "bikini top". The harder and more time consuming part of this project was making the hula skirts. I used wrapphia ribbon which can be found at craft supply stores. Starting with a 7-8 inch piece I knotted on smaller pieces one after the other the to make the skirt. You really only need about 4-5 inches of skirting. Trim the bottom of the skirt to appropriate length and then tie on doll. To make the lei, I stuck flower stickers on a piece of elastic roping. Hot glue helped to keep it in exactly the right place on the doll. To help anchor the dolls in the sand I hot glued their feet to a jar lid. To assemble: place sand in storage container, arrange dolls, top with more sand and start tossing those rings! 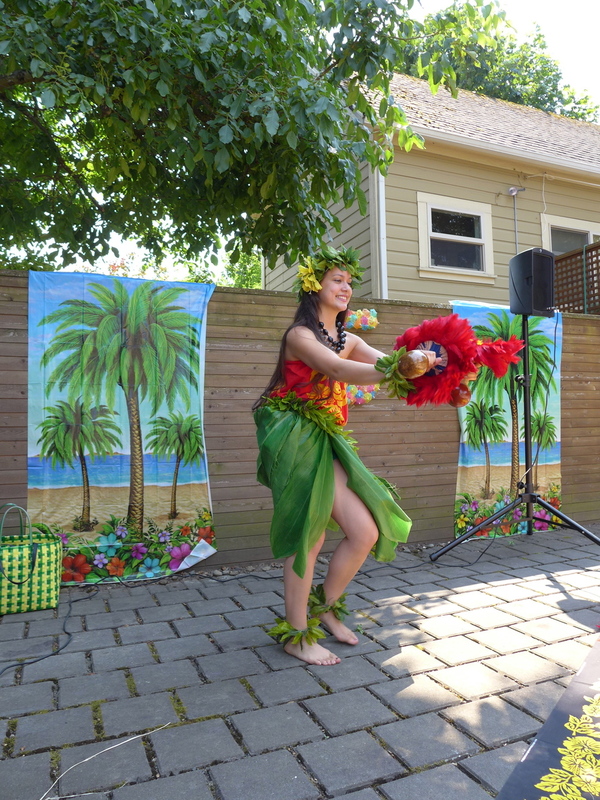 Every hula girl needs a lovely flower lei to wear with her grass skirt. I really wanted fresh flowers but I have two things working against me: one, I'm not in Hawaii and my access to the appropriate flowers is very difficult and two, with temperatures expected to be 89 degrees the life expectancy of those blossoms is very short. A paper lei craft activity seemed to be the perfect answer. It was even easier than I thought thanks to Fiskars. 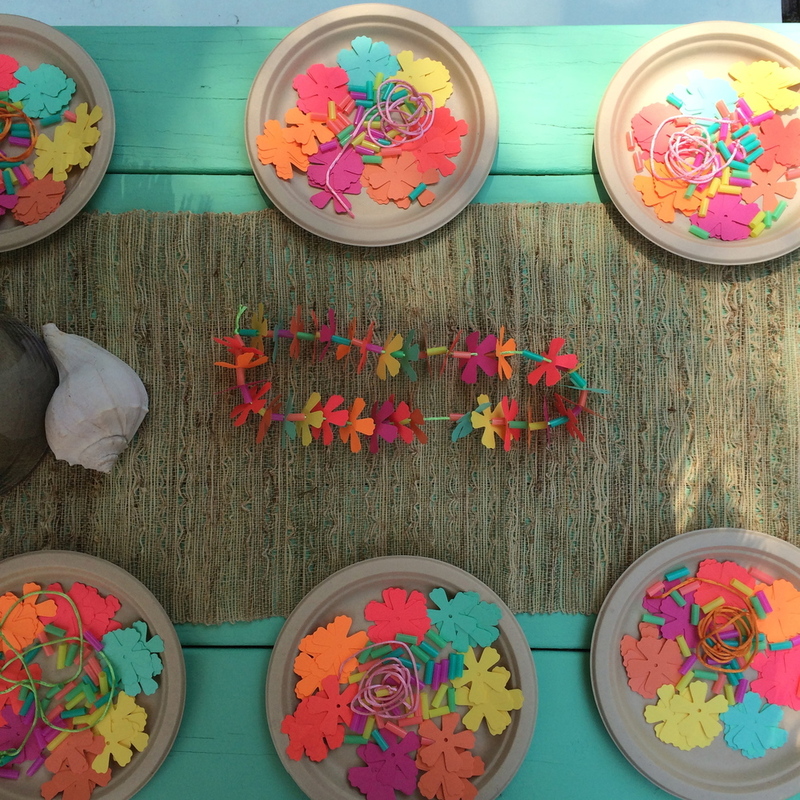 One Fiskars flower punch, straws cut into 1/2 inch pieces, silk roping, lovely colors of cardstock, a hole punch, and paper plates and I was ready to get these lei making kits together so that the guests would have all they need in one place. I tied a straw "bead" to one end of the silk roping and on the other end I put a little dab of clear nail polish to keep it from coming undone as well as make it easier to thread the flowers and beads. The idea is to do one flower and then one bead, but I'm sure there will be a little creative lei making interpretation going on. I look forward to seeing them! Miss Clementine turns five years old today! Time flies. 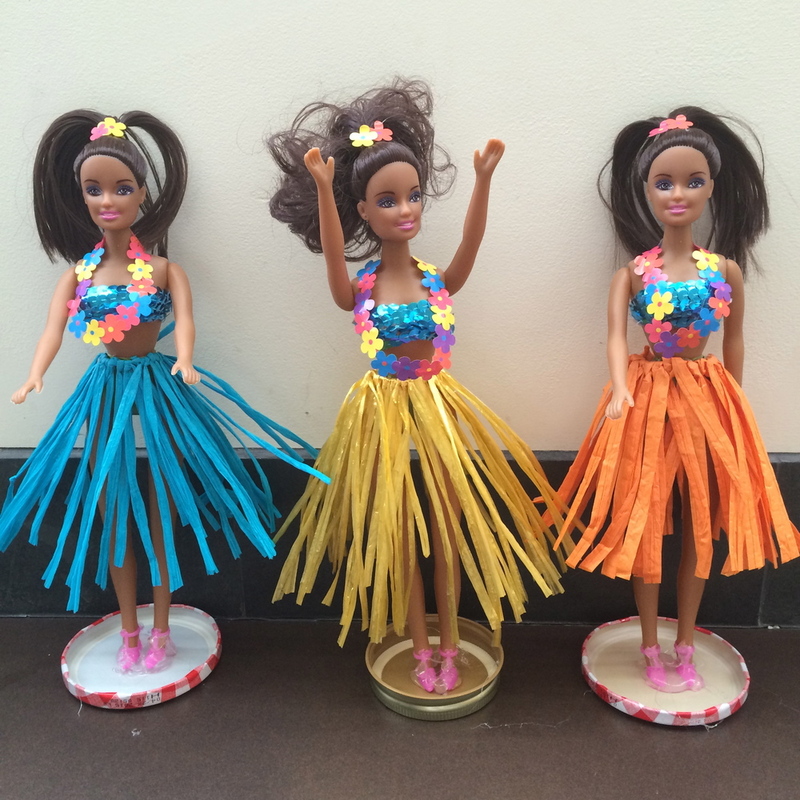 This year we are having a small hula girl party to celebrate. While searching for some tropical party inspiration I came across a wreath covered in cocktail umbrellas. A cute idea that I customized to suit our party. Instead of buying one large piece of 1" styrofoam I opted for two smaller pieces. I put them together, drew out my big 5, and then cut it out with a sharp knife. (They do sell special foam knives but I just used what I had.) Styrofoam glue and some toothpicks helped my number five stick together. Crepe paper streamer was the perfect size to glue around the outside of the number so it had a more finished look. Now the fun part: Umbrellas! I ordered a box from amazon. One by one I put a dab of glue on the end of the umbrella pick and stuck it into the foam trying to vary the colors a bit and not create too much of a pattern. This would be easy to do for any number/age and looks so great hanging on the wall or even a door.